First of all, a BIG thank you for volunteering as an editor/researcher for our whakapapa. Whether you are a seasoned genealogist or someone who is taking your first tentative genealogy steps, we are grateful for your assistance. Editing can be difficult initially so therefore the expectation is that there will be the occasional editing mistake. All we ask is that you please read these instructions and use them as a guide while learning. There is no need to worry about making mistakes because all edits to the whakapapa are tracked by administration, so any errors are easily corrected. Although it is possible to edit on any device, we recommend that you use either a laptop or desktop. This becomes a necessity when preparing, adding and editing media items. For convenience, you may print these instructions via the print icon in the webpage header. Every section within this page is collapsible to save on paper and ink. If you need clarification on anything, please contact us. Once you have mastered the editorial processes, you may like to also help out with the administration side of the website one day. There are numerous points to access the editing side of the whakapapa. As you navigate the site, you may discover more of these than just the ones that are shown below. Feel free to use these if it makes your job easier. You have limited access to the Administration side of the whakapapa. The Adiministration Links are just above the branch navigation bar of all the branch pages and also in the Info tab on the header navigation bar. There are additional help instructions via the “help with this section” tab at each stage of editing but please try to adhere to the processes below. For privacy reasons, living people must be marked as living so that only registered users of that person's branch can see their details. If they are not marked as living then their personal details can be viewed in the various public anniversary lists and all their details viewed during the odd occasion we may open the website on special occasions. Do not mark them as private as this will result in only the administration being able to view their details. 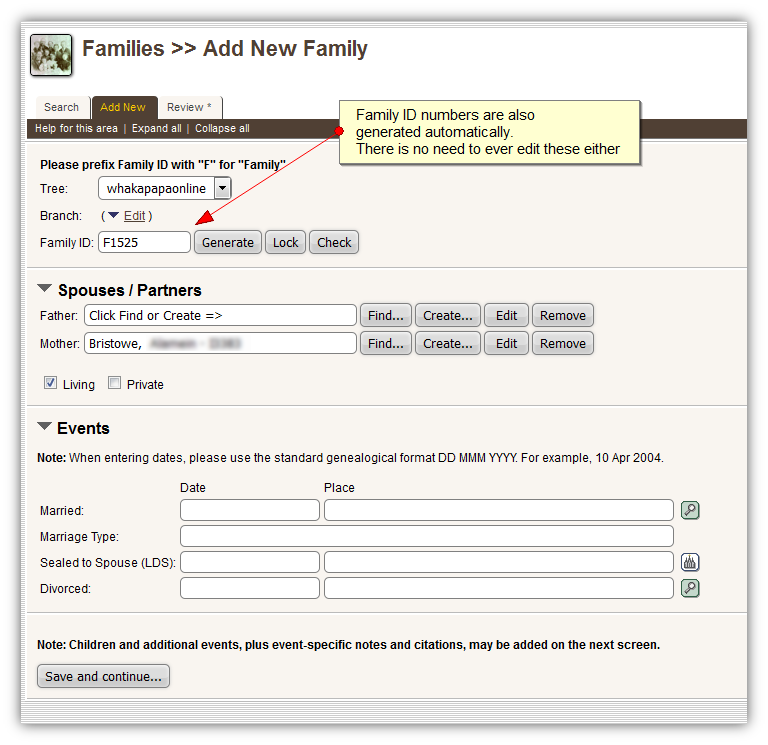 There is no need to enter this information when adding individuals and families as these are automatically generated. Please do not attempt to alter any ID numbers as this may cause unessesary detremental implications like the failure of existing external links. Surnames are to be entered as they naturally appear in written form eg Smith, Brown, Jones etc. Please do not "ALL CAPS" surnames in this database. Dates are a vital part of family research, so accurate reporting of dates is very important. Always enter dates in the standard genealogical format, DD MMM YYYY (for example, 22 Mar 2011, 1 Apr 2012). If you have added a new place, they will not appear in the maps until the place has been manually geocoded. 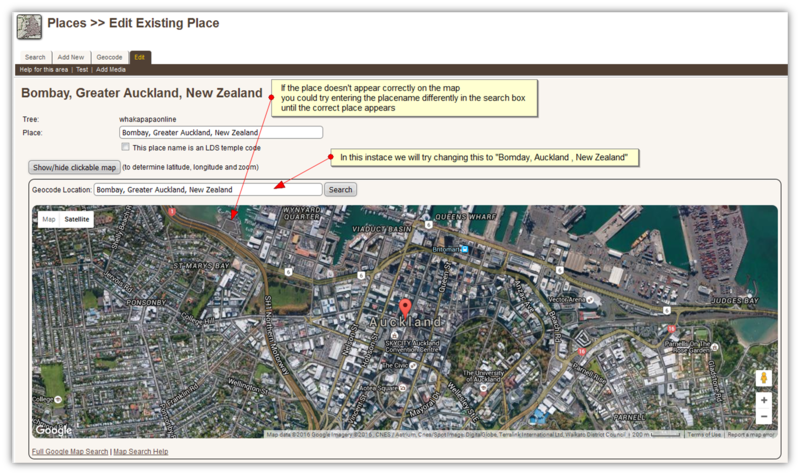 Refer to the next section "Manually Geocoding Places". We have included detailed instruction for any editing scenario that you may need help with. If there are any that we have missed, please contact us. Editing may appear to be a rather complex and tedious process, however, once you get your head around editing any of the items below, the process is very similar for them all. Occasionally, individuals and places can be inadvertantly entered into the database more than once. If this occurs or if you discover any of these, our administrators have the ability to merge these into 1 individual or place. Please contact us with the relevant information.Thank you. The deletion of individuals, families, media items, places and cemeteries can only be done by administration. If you have accidentally entered any of these to the database by mistake, or you would like them removed for any other reason, please contact us with the relevant details. 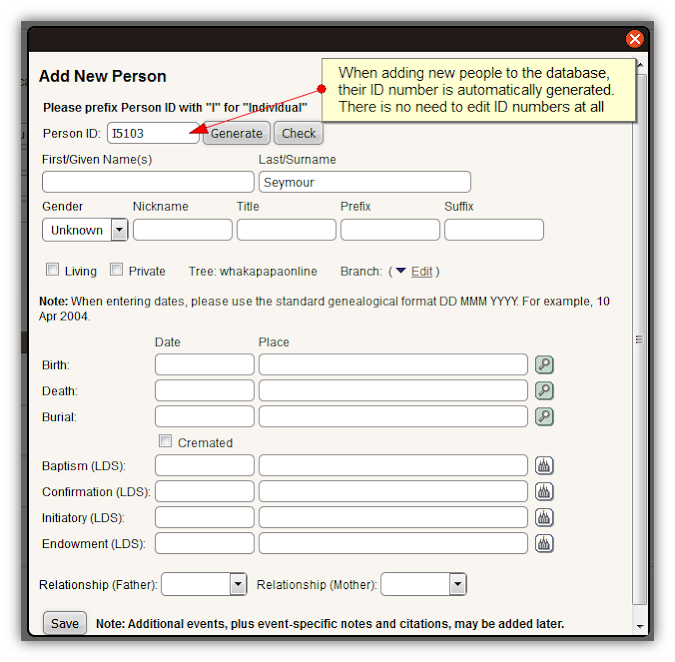 In ALL instances, you will be adding people who have an immediate connection to an existing person in the database. Therefore, you will be adding a partner/spouse, child, sibling or parent to that person. You will progress to their grandparents, uncles, grandchildren using these same processes. Please refer to the instructions in this section on how to add people to these various immediate relationships. DO NOT add people through the “add new” person facility. Using this facility requires you to go through another process to find them again before adding them to a relationship and it is easy to get lost doing so. The processes below incorporate both steps, are much quicker and there is less chance of you getting lost. 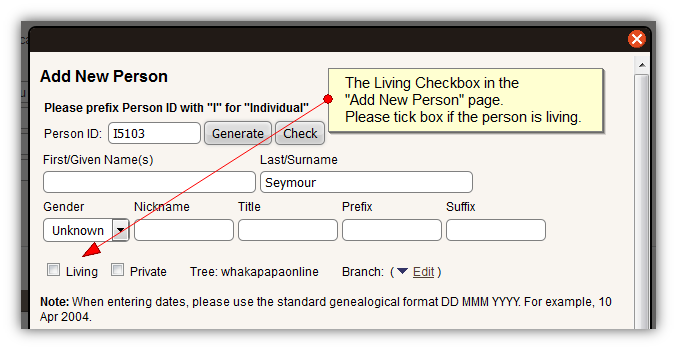 When new (living) people are added to the whakapapa, they will need to be added to a branch before users of that branch can see their full details. Unfortunately this can only be done by administration. Please contact us for branch updates anytime new people are added. To create a new family you must first add a new partner or spouse to an existing person. Refer to the next section. A new pop-up window should appear where the new spouse/partner's details are entered. On this screen, the family children can be added if required. If there are no children, proceed to step 11. Scroll down to the children section and you press "create"
A new pop-up window should appear where the child's details are entered. A new pop-up window should appear where the new mother or father details are entered. 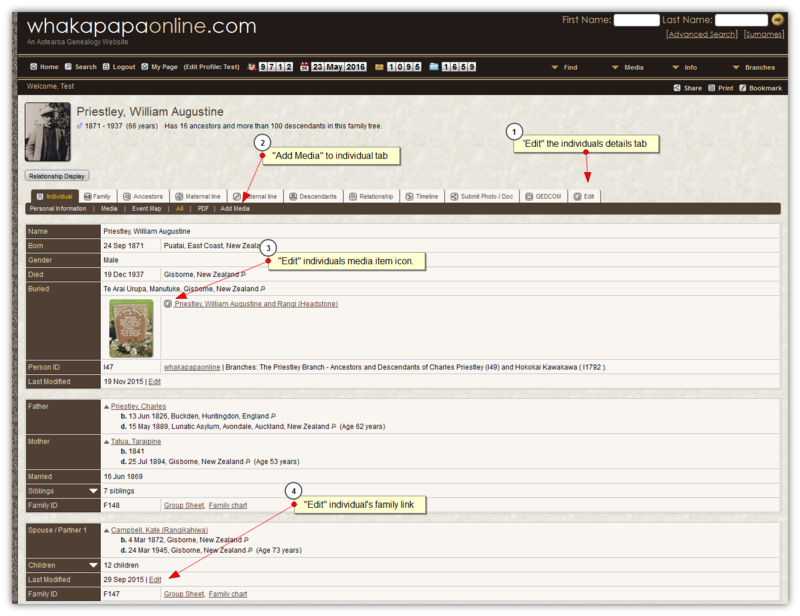 By adding (or submitting) media items to people's pages, allows us to better understand the intricacies of our whakapapa. It allows whanau to better connect with our ancestors and with each other. It brings substance and a genuineness that a list of names simply does not. We ARE after all, more than just a name and birthdate. The best source of a person’s profile picture and information is their facebook page. We each have access to different peoples pages. These pages normally contain pictures of other family members, their parents, grandparents, cousins etc. Many people also share their memories and post tributes about their tipuna with their facebook friends and family. They share these pictures and stories because they want others to know about their loved ones and to remember them - There is no better way of remembering someone than having this information stored on their whakapapa. Therefore, It is quite ok for us to copy these pictures and stories from facebook to put on the whakapapa. These items then become part of our family history. The more family history we gather, the richer and more rewarding the whakapapa becomes. Genealogy is really about recording people’s lives and not just a list of names and numbers. If this has just dawned on you, then welcome. The next stage of your journey has just begun. 1. If you plan on only ever adding a dozen or so media items to the whakapapa, or only add them sporadically, the easiest method by far is to submit them via the submit tab on that individuals personal page. These are normally processed by administration within 48 hours of them being submitted. 2. If you would like to add your media items yourself, and/or if you are up for a bit of a challenge, then please carefully read and follow instructions in the following sections. For convenience, you may print these instructions via the print icon in the webpage header. Every section within this page is collapsable to save on paper and ink. If you need clarification on anything, please contact us. This involves uploading files (photos, documents etc) from the hard drive of your computer, to individual’s pages on the whakapapa. If you would like to add information that aren’t files or have external weblinks links to media, the processes for these are explained further down the page. Adding media may appear to be a rather complex and tedious process, however, once you get your head around adding any type of media item, the process is very similar for them all. In the sections following this are the subtle variations for the different type of media that you may like to add to a person’s page. If there are any that we have missed, please contact us. Reload the person's page and check your mahi. This article gives some simple tips on how to crop great looking profile photos and instruction on how to crop them on your Mac or Windows device. For the picture to display best on the whakapapa charts, they should cropped like the "Tight Crop" example in section 2 of the article. Adding a person’s profile photo is probably the most effective way of enhancing our whakapapa and the person’s profile. 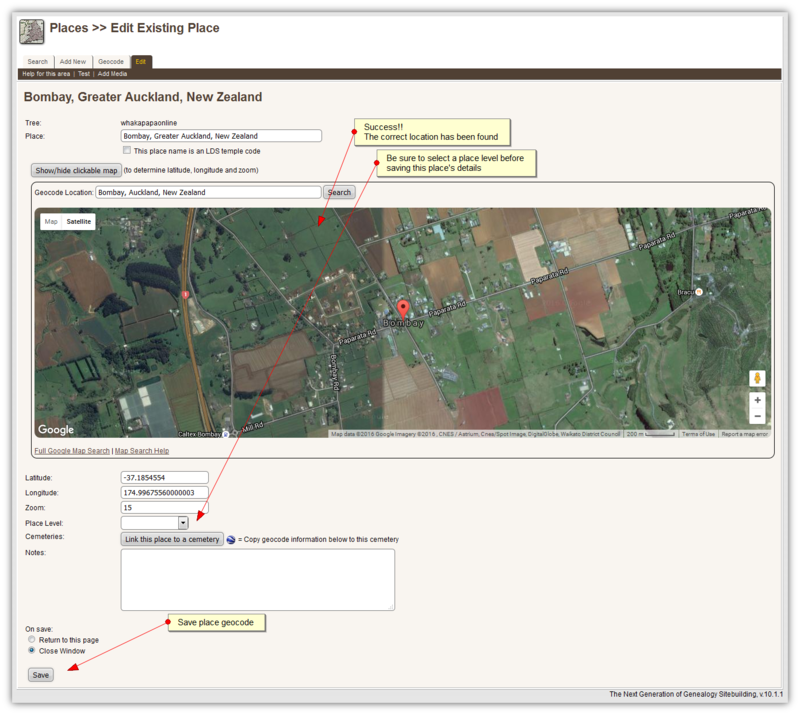 It is the person’s visual identity as it appears throughout the website on family pages, search results and whakapapa charts etc. Please ensure that your Profile photos are prepared before uploading them to the whakapapa. Save and Check your mahi. Adding a person’s headstone photo is another helpful way to connect whanau with our ancestors, our urupa and whenua. It provides whanau the opportunity to pay their respects virtually if they have no means of doing it physically; and with urupa not normally having written records, this will help ensure that the final resting place of our tupuna and their memorials will never be forgotten. Before adding a Headstone photo, you may like to first check that the its cemetery is in the database. If not you can add it first using the “Adding Cemeteries” process below. This will save you having to return to the headstone file and link it later. Please ensure that your Headstone photos are prepared before uploading them to the whakapapa. Cemetery - You may select the cemetery where the headstone redides. We like headstone photos placed prominently in the burial section of the person’s profile. You can do this in the Media links section. Click on the persons edit button (tick icon). In the “Event” dropdown field, select burial. Do this for each person on the headstone . Cemetery - Double check that the headstone has been linked to the cemetery where it resides. If the people in the photo are from separate families, add the photo using the “The Basic Process ” but with the variations below. Go to one of the parent’s pages, and then scroll down to the family section and click on edit. Please ensure that your Family Photos are prepared before uploading them to the whakapapa. You may Image Map (Tag) the photo (refer to the instructions below). This allows you to link (tag) people in the photo to their personal page. Documents support the facts about living people or ancestors on the whakapapa. They are official documentation that are normally signed, dated and sometimes stamped. Under Thumbnail Image File, we have specific pre-created thumbnail images you can use (illistrated above). Click “Select” and you will see the list of these icons. Select a suitable thumbnail by clicking on its select button (tick icon). 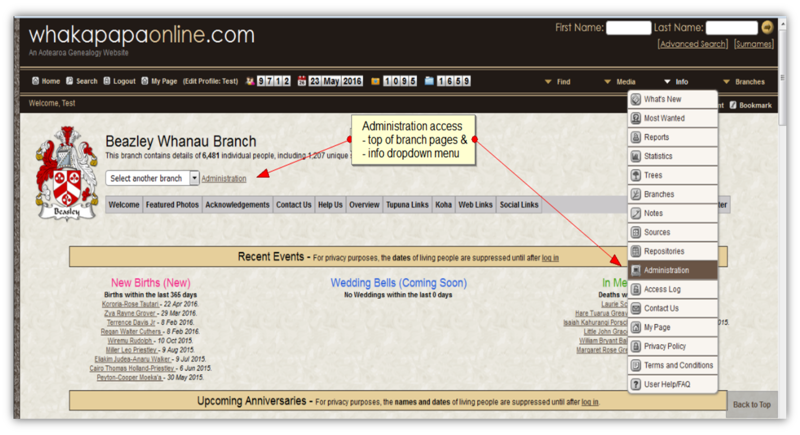 Although we love receiving historic information about our ancestors, you may also add information about living people... their special occasions, weddings, award ceremonies, news articles etc. Anything and everything about any person can be added. Note - We like to have biographies appear prominently between the birth and death sections of the person’s page. To do this you will need to first create the “Life Story” event on that person’s page by going into their “Person Edit” page and scrolling down to the bottom of the events section. There you will see the “Add New” event button. If you click on that, the New Event box will appear where you would select the new event type as “Life Story”. You will need to put something in the description section to enable the new event to be saved. Save the new event. You then go to your biography document edit page and into the media link section for the person. go to the "Media Links" section and click on the edit button (tick icon) next to the person's name. Select "Life Story" in the Event dropdown box and save. To create a Publication for a person that isn’t a file, you can use the Body Text field in the Add New Media page. You simply enter or paste your text in the BodyText field. If you are familiar with HTML then you can also click the HTML icon to directly edit the HTML code for the page. Under Title, enter a title as per the file name. ie Surname, Christian Names (file type). This is what users later search for when searching for it in the media listings. If a media item already resides somewhere on the internet, you can link it to a person or place. When adding the media item, check the “This media comes from an external source” box and the the Media URL field will appear. You must supply the absolute web address (for example, http://www.examplesite.com/examplepage) into this. Under Thumbnail Image File, we have specific pre-created thumbnail images you can use, click “Select” and you will see the list of icons. Select the appropriate icon by clicking (tick icon). Enter a title as per any othe media item. ie Surname, Christian Names (file type). This is what users later search for when searching for it in the media listings. 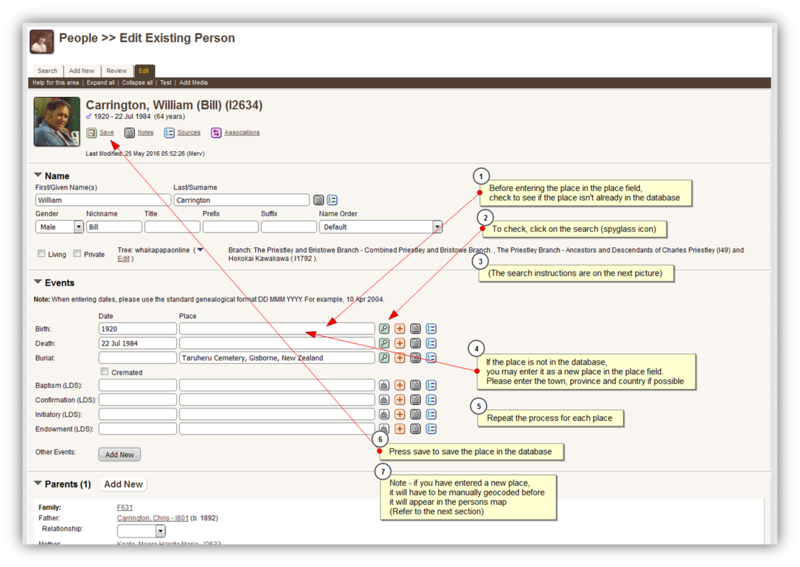 This allows you to link any media item to multiple individuals, families or places. It will then display at those locations and precludes the need for any media item to be uploaded more than once. You first need to navigate to the “Media Links” section for the media item concerned. 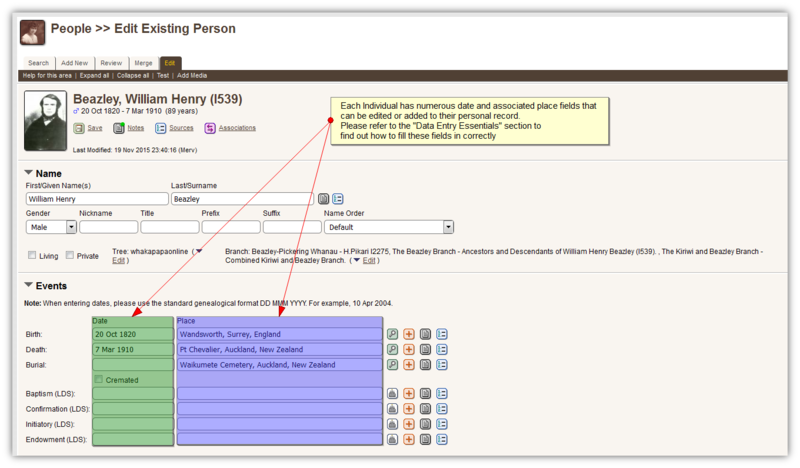 For each link, first select the tree associated with the person, family or place (whakapapaonline). Next, click the magnifying glass icon to search for that person or place. A popup window will appear to let you do the searching. When you find the desired entity description, click the "Add" link at the left. You may click "Add" for multiple entities. When you are finished creating links, click on the "Close Window" link. You may edit or delete an existing link by clicking on the Edit (tick) or Delete (cross) icon next to that link.. Editing a link allows you to associate the link with a specific event (like headstone pics into the burial section) and give it an Alternate Title and Alternate Description. This allows you to link (tag) people in photos. This not only helps users identify people when viewing photos but also provides a link to those people’s personal pages. You would do this mainly for family photos but any photo can be tagged if you so choose. Note: The media item must be a valid JPG, GIF or PNG image to use this feature. The “Image Map” section will start out collapsed. To expand, click on the "Image Map" header, or the arrow next to it. 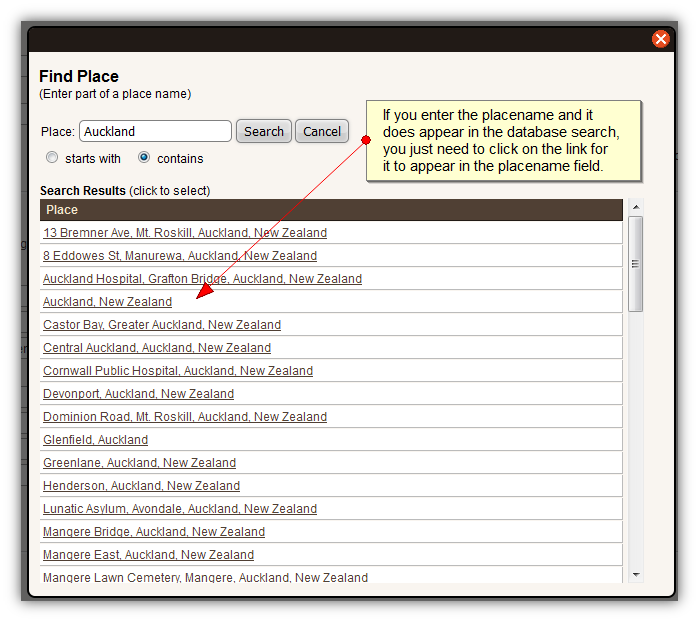 For each region you want to link to an individual, first select the individual's tree (whakapapaonline). Define the region by drawing a rectangle on the image with your mouse pointer. Start by clicking at the upper left corner of your rectangle, then hold down the mouse and move it down and to the right to draw the rectangle. When you get to the lower right corner of the rectangle, release the mouse. This will select your image coordinates. 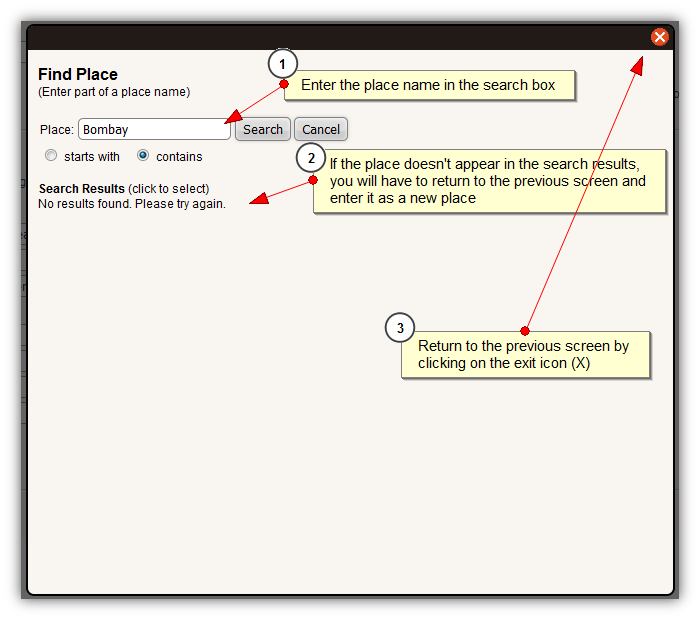 After the coordinates have been selected, a popup box will be displayed to allow you to find or enter the individual's name. Enter all or part of the individual's name to locate possible matches, and then choose the correct individual from the candidates displayed. The box will close and the code for this region will be added to the Image Map box below the image. Repeat this process for any additional regions needed. All new code will be added to the end of that already in the Image Map box. The deletion of any files can only be done by Administration. Please contact us if you would like any deleted.